Computational Molecular Science is the successor of the highly acclaimed Encyclopedia of Computational Chemistry, which was published by Wiley in 1998, and is the ultimate resource on all aspects of computational chemistry and its applications in chemistry, biology and materials science. Capturing the interdisciplinary flavour of the field, authors address key topics from differing perspectives such as chemistry, biology and materials science. Focus Articles present short, technical contributions describing specific real-world issues, e.g. implementations etc. A special focus has been placed on computations and modeling of relevant biomolecules which are essential to new developments in medicinal chemistry. Computer and Information Science includes a wide range of techniques and applications used in cheminformatics, such as artificial intelligence, patent information, semantic web, data mining, automated synthesis design, etc. 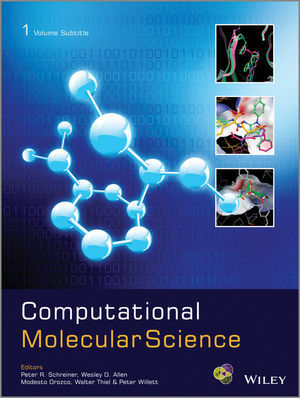 All chapters included in Computational Molecular Science have also been published online in WIREs Computational Molecular Science between January 2011 and June 2014. Wiley Interdisciplinary Reviews, or short WIREs, combine the best possible features of major online reference works (didactic structure, high visibility, fast searches, and electronic accessibility) with the completeness, rigor, and overall high quality of review journals. Wesley D. Allen, Associate Professor, Department of Chemsitry, University of Georgia, Athens, USA. Walter Thiel, Director of Institute for Theoretical Chemistry, Max-Planck-Institut für Kohlenforschung, Germany. Modesto Orozco, Professor and Group Leader of the Institute of Molecular Modelling and Bioinformatics, Institute for Research in Biomedicine, Barcelona, Spain. Peter Willett, Professor of Information Science, University of Sheffield, UK.